Arguably the best loved sculpture work in the garden. 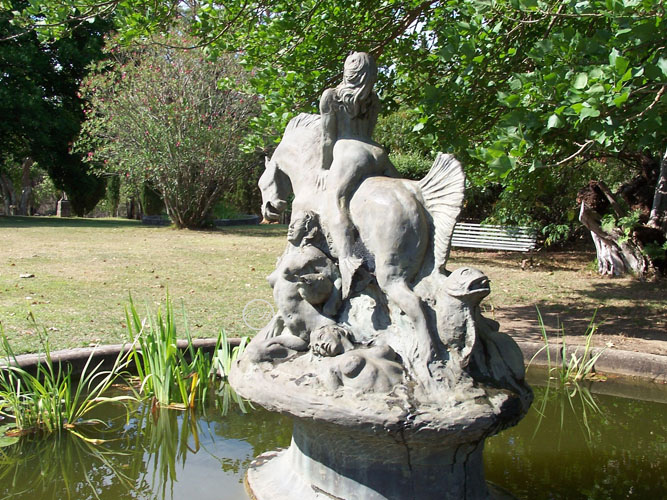 The fountain dates from the 1940’s and was made by Norman Lindsay after hearing that town-water would soon be connected to the property. The fountain is a wonderful baroque influenced work. The fountain you see today is a bronze copy of the original cement fountain. The original was removed to a safer home inside the gallery after copying. The water pool below is full of gold fish and in summer the surface is partially covered with waterlily flowers. Native wood ducks are often found swimming in the water. We request that visitors keep away from the ducks especially when they have baby ducklings.